Since their contracts aren’t fully guaranteed, it can be difficult to determine the highest-paid NFL players. One benchmark of NFL player salaries, however, is the cap hit. In simple terms, salary caps put a dollar amount to a player’s earnings based on NFL salaries and bonuses in any given year. GoBankingRates.com used cap hits from Spotrac.com to determine the highest-paid NFL player on each team for the 2016 season. Players are listed from lowest to highest cap hit for 2016. The Rutgers alum enters the fifth year of a six-year contract that pays out $43.04 million overall. He received an overall signing bonus of $9 million and earns a base salary this year of $7 million. 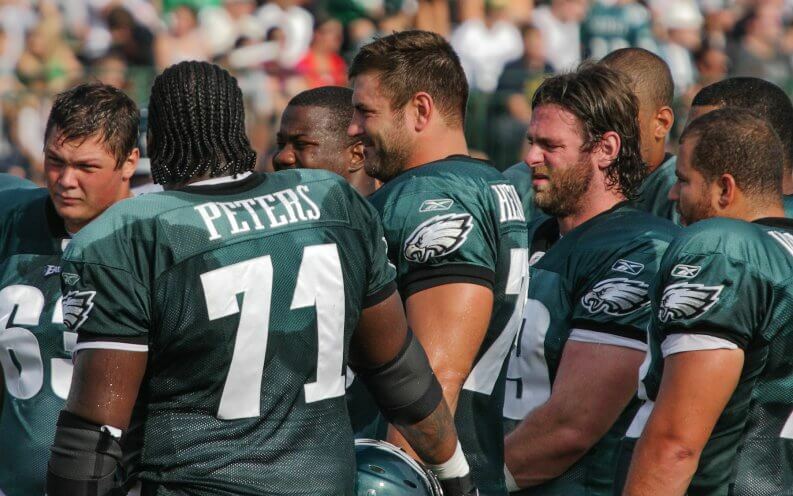 Although Fletcher Cox boasts a six-year, $102.6 million contract — the highest among the Philadelphia Eagles — Jason Peters has a higher cap hit. Peters’ contract carries an $8.05 million base salary this year, with a $1 million signing bonus. Next year, his base salary jumps $1.9 million, with an $11.2 million cap hit in 2017. 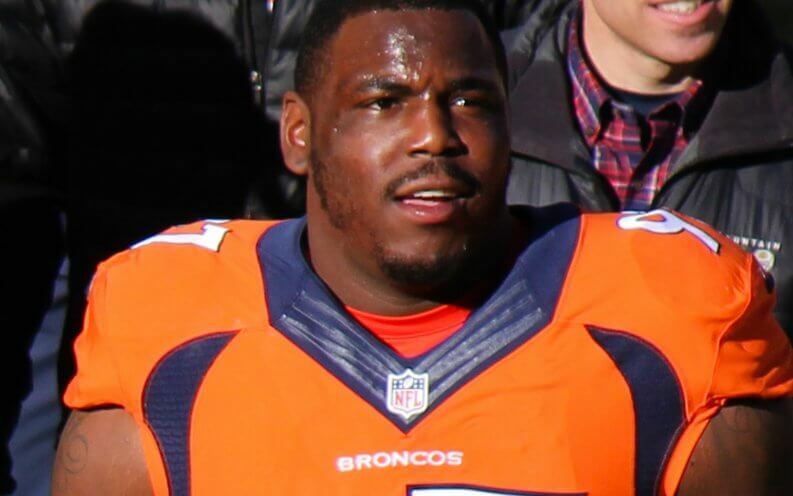 After four years in the NFL, Malik Jackson inked a six-year, $85.5 million contract with the Jacksonville Jaguars, the cheapest NFL team to watch live. The NFL player will earn an $8 million base salary this year, with a jump to $13.5 million next year. He has a cap hit of $10 million. 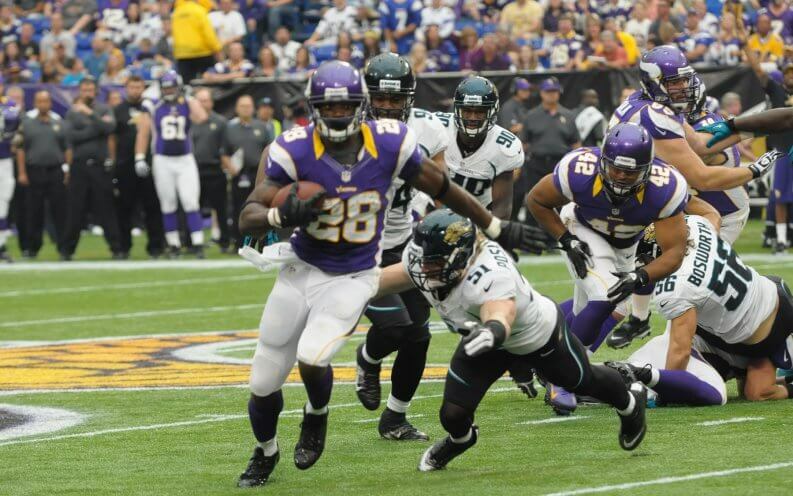 Widely considered to be one of the greatest running backs of all time, Adrian Peterson has a net worth of $30 million. The 2007 first-round draft pick signed a three-year, $42 million contract that pays him a base salary of $7.75 million this year. 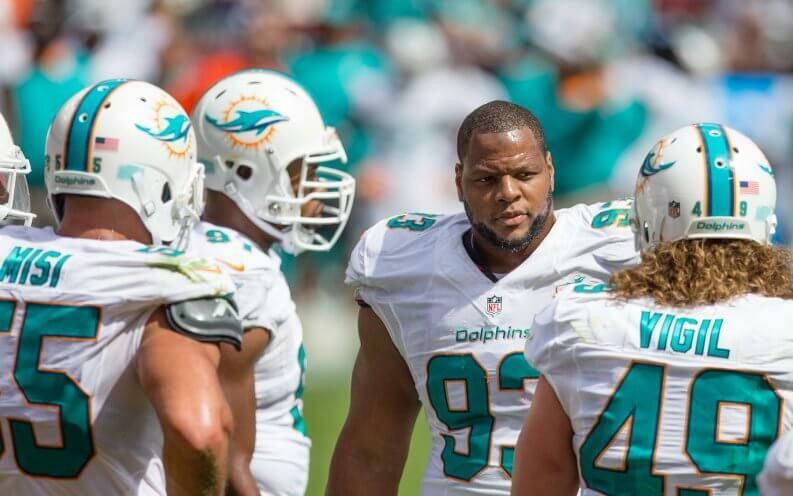 Ndamukong Suh’s net worth of $40 million is supported by a six-year, $114.38 million contract. His deal includes a 2016 base salary of $3.49 million and an annual signing bonus of $5.1 million. 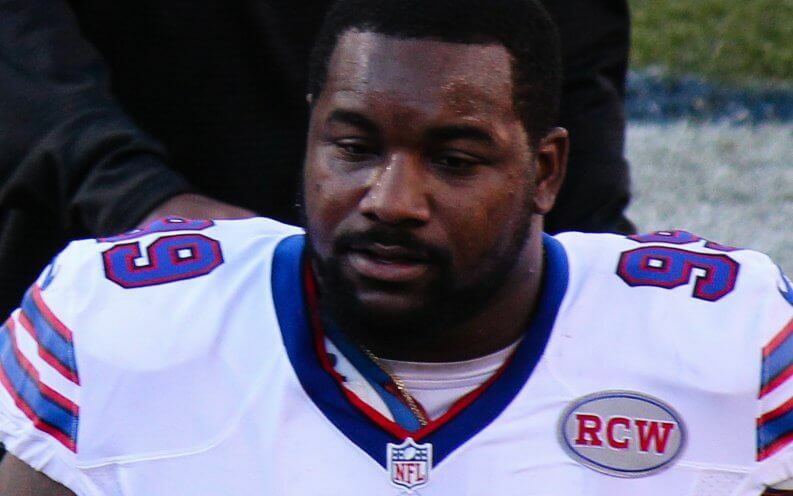 With a cap hit of $11.51 million, Marcell Dareus earns a base salary of $6.04 million and a $5 million signing bonus this year. The payments are part of a six-year, $96.57 million contract. 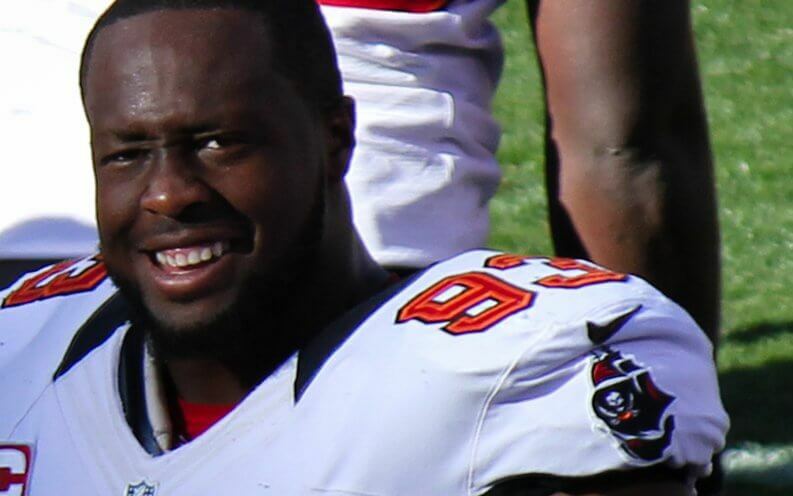 First-round draft pick Gerald McCoy has a cap hit of $13 million and a net worth of $20 million. He earns a base salary of $6 million this year off a six-year, $95.2 million contract, which includes an overall $2.5 million signing bonus. 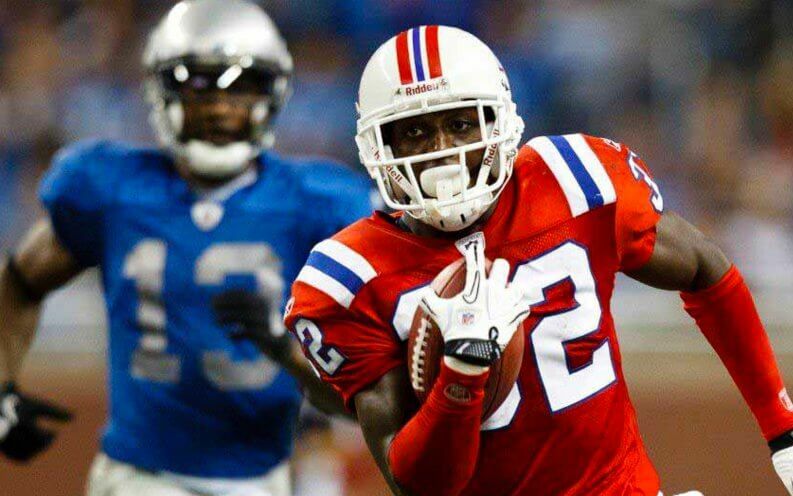 Although Tampa has been plagued by losing seasons in recent years, McCoy was selected for four straight Pro Bowls. 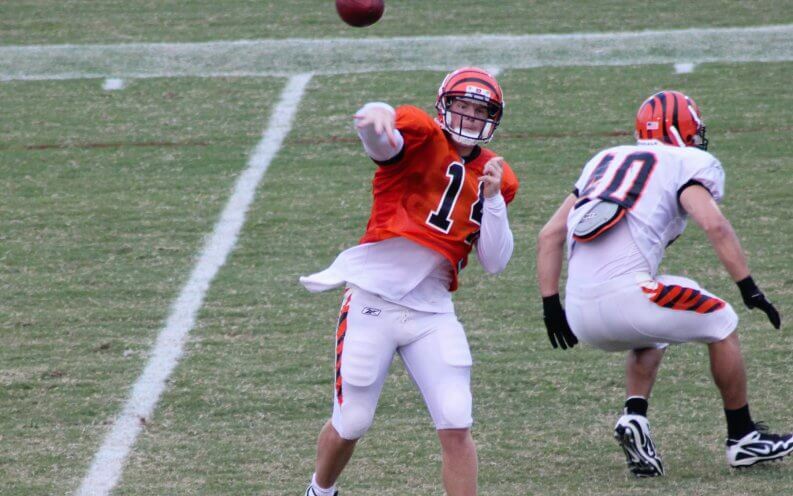 Andy Dalton enters the NFL season with a $13.1 million cap hit, with a $10.5 million base salary and $2.4 million signing bonus for the year. 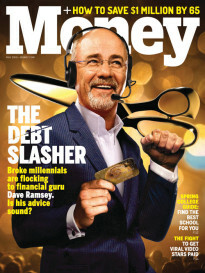 His individual net worth is estimated at $15 million. The fourth-year guard is in the first year of a five-year, $58.5 million contract that pays him a base salary of $6.7 million this year. 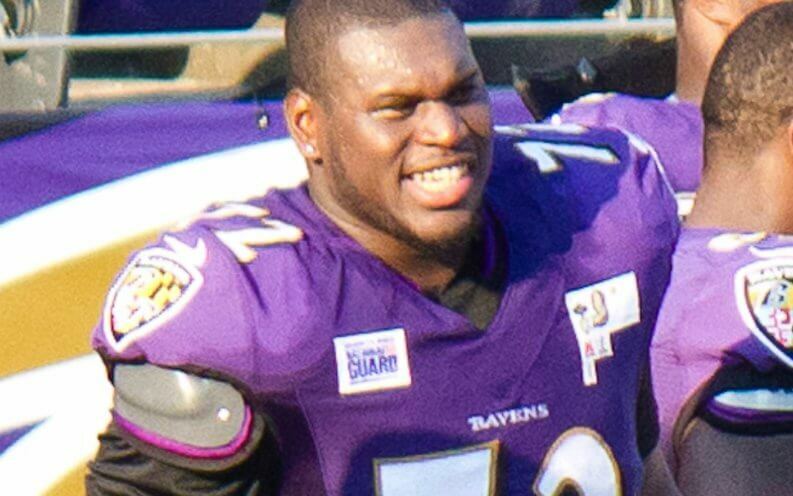 Although he’s been named by ESPN as one of the top 100 NFL players, Kelechi Osemele has an otherwise unimpressive contract. 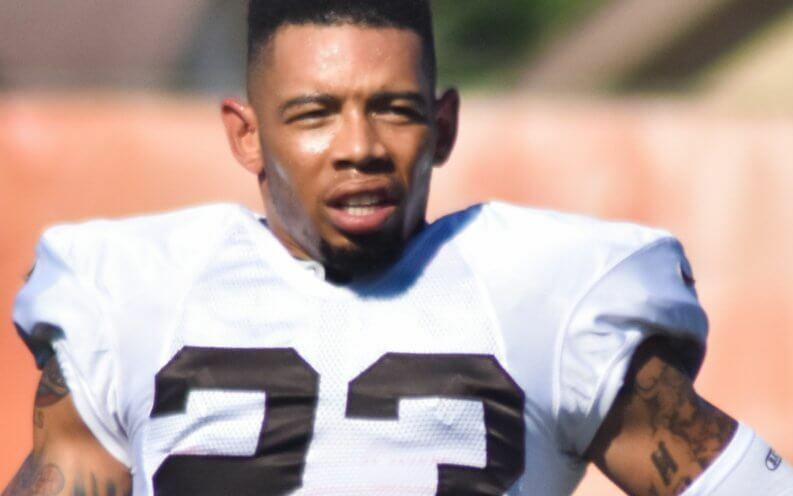 Joe Haden signed a five-year contract with the Browns, earning him $67.5 million over five years. This year, he earns a base salary of $10.1 million and a $3.2 million signing bonus. The six-year veteran defender has a cap hit of $13.4 million. 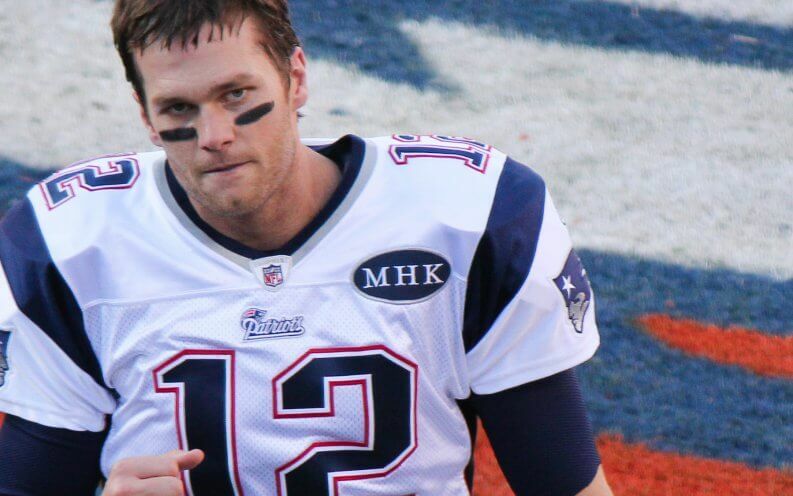 Arguably the greatest quarterback ever to play the game, Tom Brady boasts six Super Bowl appearances — and has a net worth of $180 million. His cap hit is $13.76 million, and his two-year, $41 million contract includes an overall $28 million signing bonus. His base salary this year, however, is an unimpressive $765,000. 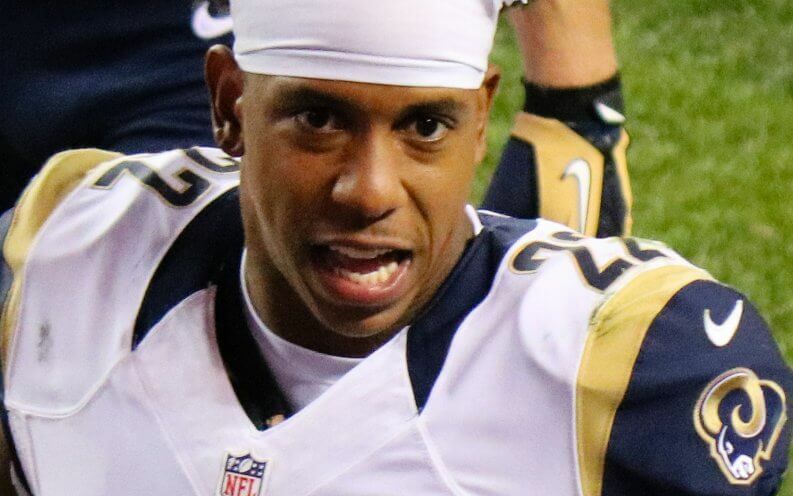 Although Trumaine Johnson failed to secure a long-term contract, he enters the season with a one-year, $13.95 million contract. As a respected cornerback in the league, he’ll undoubtedly be watched closely during the Rams’ inaugural season in Los Angeles. 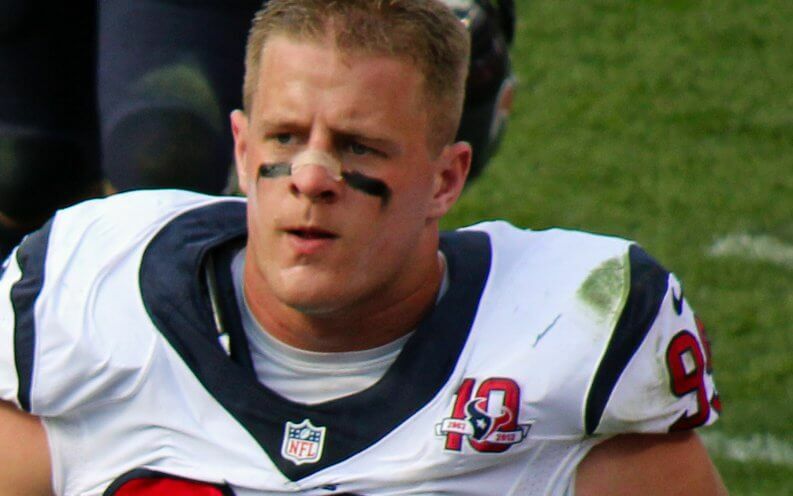 The 2011 first-round draft pick signed a six-year, $100 million contract with the Houston Texans, earning him a $10.5 million base salary and $2 million signing bonus. The NFL player boasts an estimated $13.97 million cap hit. 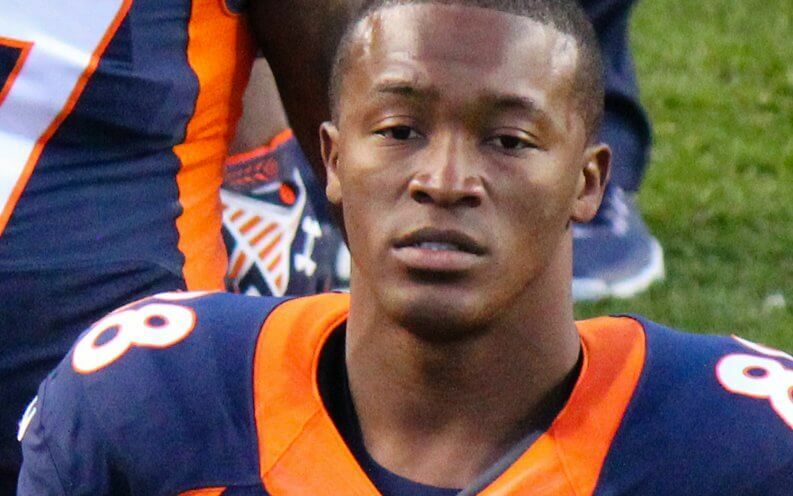 Demaryius Thomas is optimistic about 2016 despite playing for one of the worst passing offenses in the league. He received a $2.2 million signing bonus on top of a base salary of $13 million. His net worth is estimated at $9.5 million and his cap hit is $15.2 million. 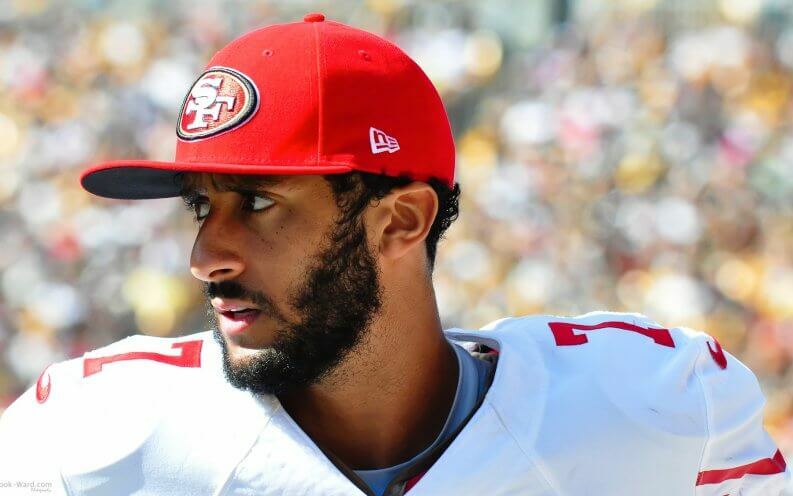 Colin Kaepernick, who stoked a firestorm of controversy by refusing to stand for the National Anthem during the preseason in protest of police brutality, has a net worth of $25 million. His six-year, $114 million contract pays him a base salary of $11.9 million and includes an overall $12.33 million signing bonus. 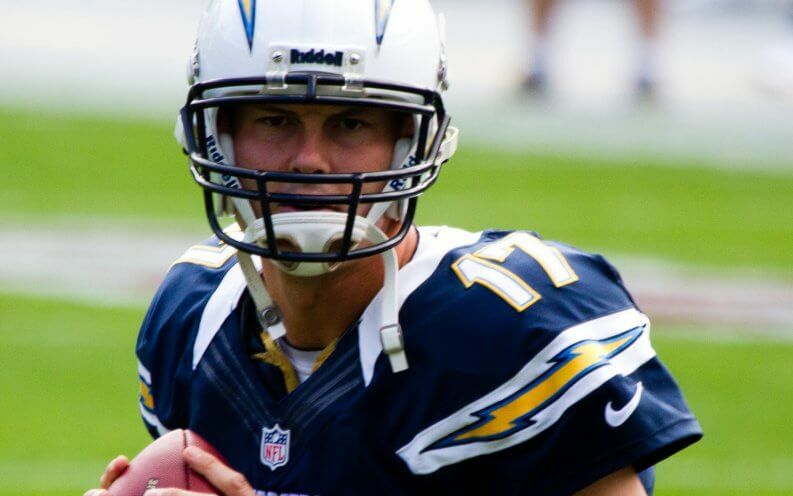 Philip Rivers, 2004 first-round draft pick, signed a four-year, $83.25 million contract, which pays a base salary of $10.5 million on top of a $4.5 million signing bonus. Rivers, who has a net worth of $50 million, has a cap hit of $16.5 million. 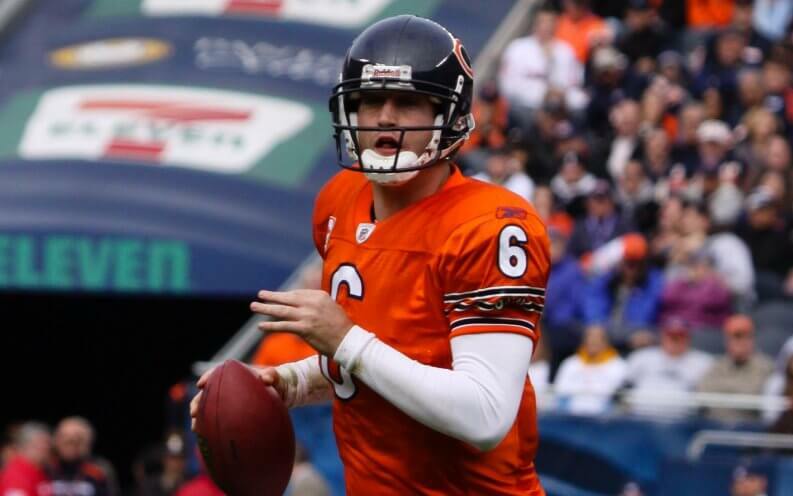 Jay Cutler’s net worth is estimated at $40 million — a low estimate considering the 10-year veteran signed a seven-year contract that pays $126.7 million through 2020. He has a $16 million base salary this year and a $17 million cap hit. 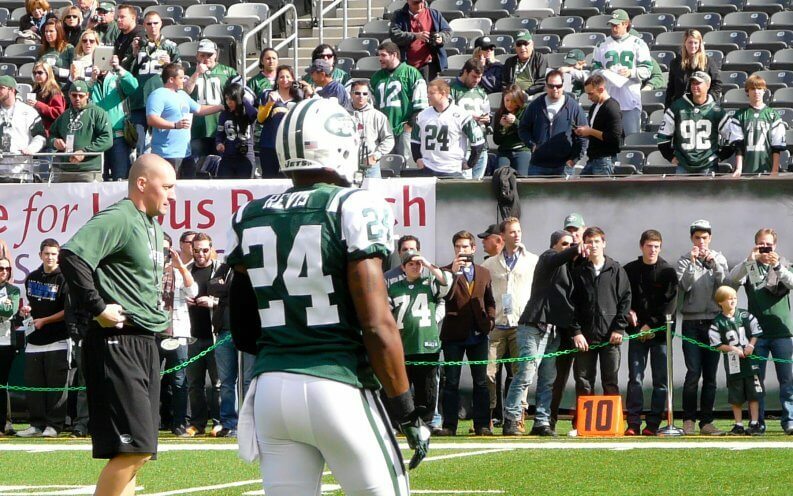 Darrelle Revis is among the best cornerbacks in the NFL. He has a net worth of $30 million and is in the second season of a five-year, $70.12 million contract that pays him a base salary of $17 million this year. 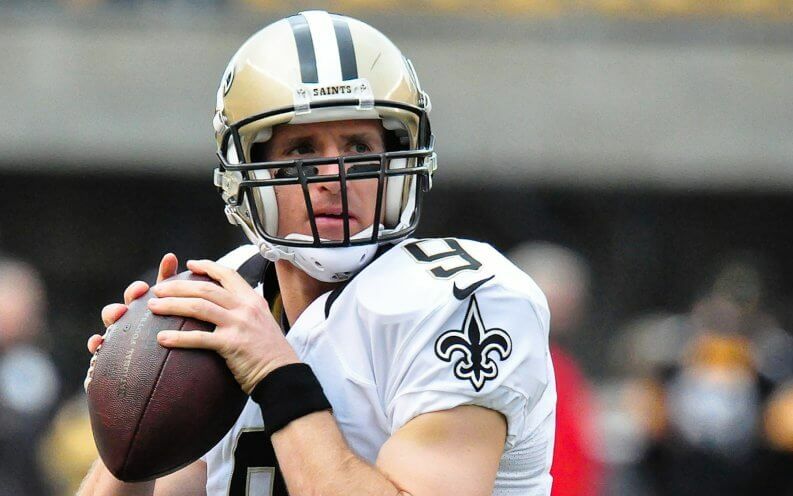 Fifteen-year NFL veteran Drew Brees enters the season on a one-year contract with New Orleans. Earning a base salary of $1 million is overshadowed by an overall $30 million signing bonus. Ranked by Sport’s Illustrated as the sixth-best quarterback, Brees has an impressive $17.25 million cap hit. 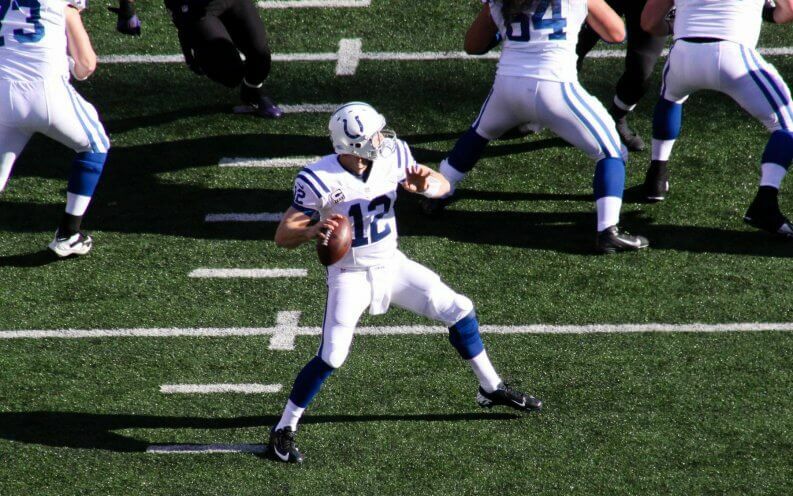 Andrew Luck’s net worth is $20 million, which he’ll certainly add to thanks to a base salary of $12 million. He received an overall $32 million signing bonus off a five-year, $122.97 million contract. That contract lands him a top spot among the highest-paid players in the NFL. 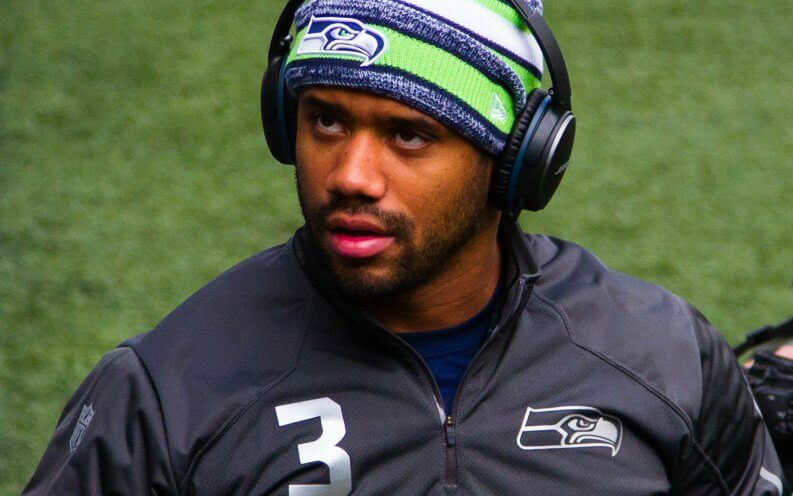 Russell Wilson has a net worth of $45 million. He landed a four-year, $87.6 million contract in 2015, earning him a $12.34 million base salary this year. 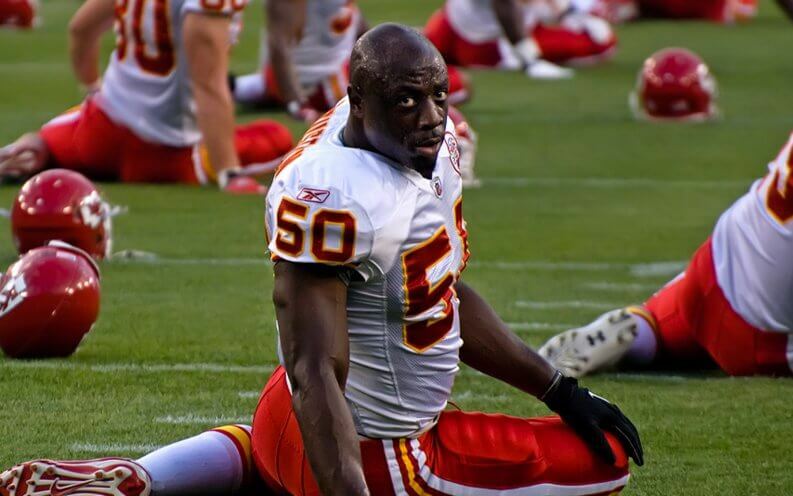 Justin Houston’s six-year, $101 million contract includes an overall $20.5 million signing bonus. The 2011, third-round draft pick has a base salary of $14.9 million this year, with a modest bump to $16.35 million next year. Unfortunately, this season lands Houston on the physically-unable-able-to-perform list for at least six weeks, after his trainer reported he is rehabbing from an injured anterior cruciate ligament. 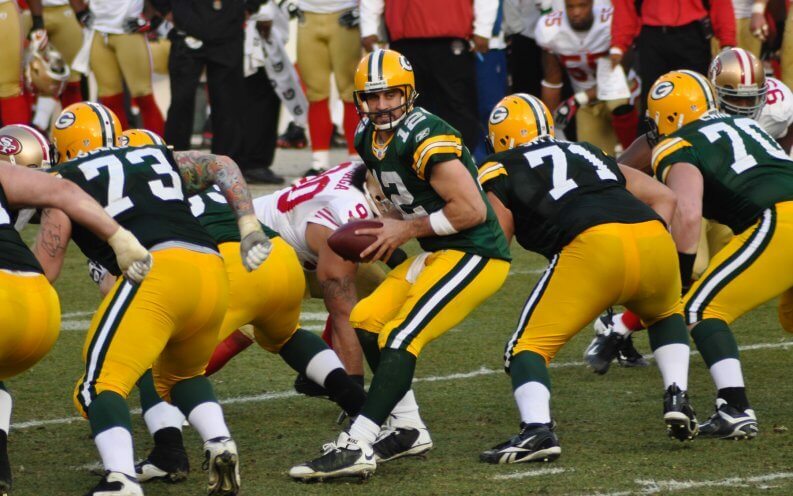 Aaron Rodgers brings in an average salary of $22 million on a five-year, $110 million contract. This year alone he’ll earn $11.5 million in base salary on top of a $6.65 million signing bonus. 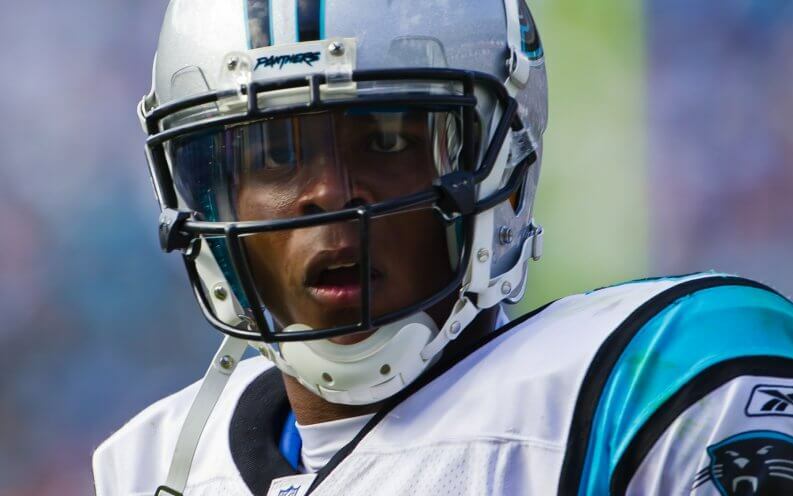 MVP and Super Bowl 50 quarterback Cam Newton led the Panthers to a 15-1 record and earned himself a spot among the league’s most marketable players. He has a $19.5 million cap hit and earns a $13 million base salary this year as part of a five-year, $103.8 million contract. His net worth is estimated at $45 million. 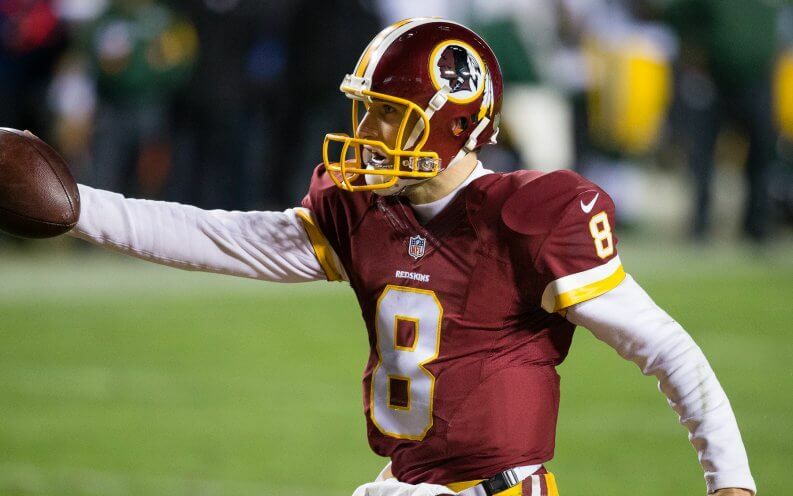 Kirk Cousins is under contract for just one year, earning him a base salary and cap hit of $19.95 million. He did not receive a signing bonus. The quarterback has an estimated $2 million. 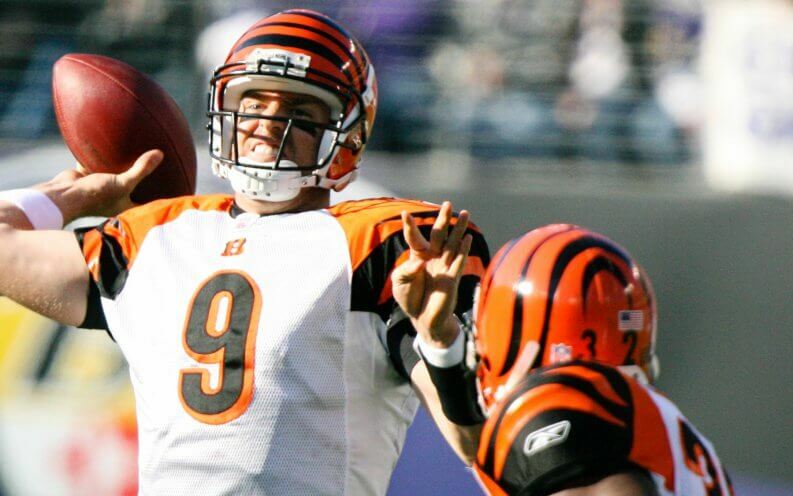 A 2003 first-round draft pick, Carson Palmer has a net worth of $60 million. After signing a $24.35 million contract in 2016, Palmer’s base salary is $7.15 million. He was awarded a signing bonus of $6.75 million and has a cap hit of $20.13 million. The veteran player says he will finish his career with the Cardinals. 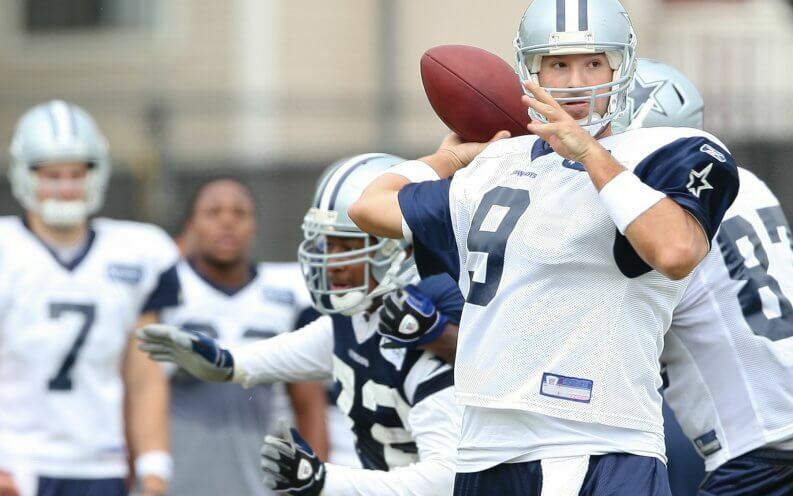 Tony Romo — who nearly landed on injured reserve — has a cap hit of $20.84 million. His six-year, $108 million contract pays out a base salary of $8.5 million this year, along with a $5 million signing bonus. Among the highest-earning football players, Romo’s net worth is estimated at $60 million. 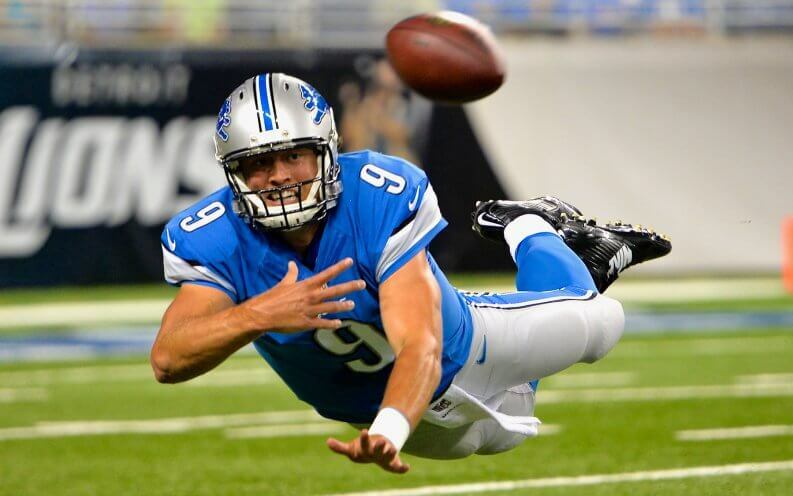 With an estimated $15 million net worth, Matthew Stafford makes a good living off the Detroit Lions. He’s on a three-year, $53 million contract that pays out a $17 million base salary and $5.5 million signing bonus this year. 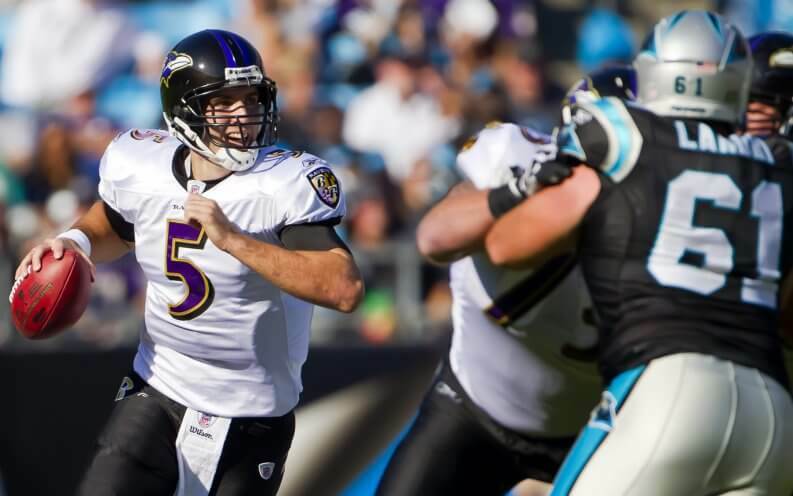 Joe Flacco, whose cap hit is $22.55 million, signed a three-year, $66.4 million contract with the Ravens, earning him a base salary of $4 million this year. The eight-year veteran played well during the preseason, considering he tore his ACL in November 2015. 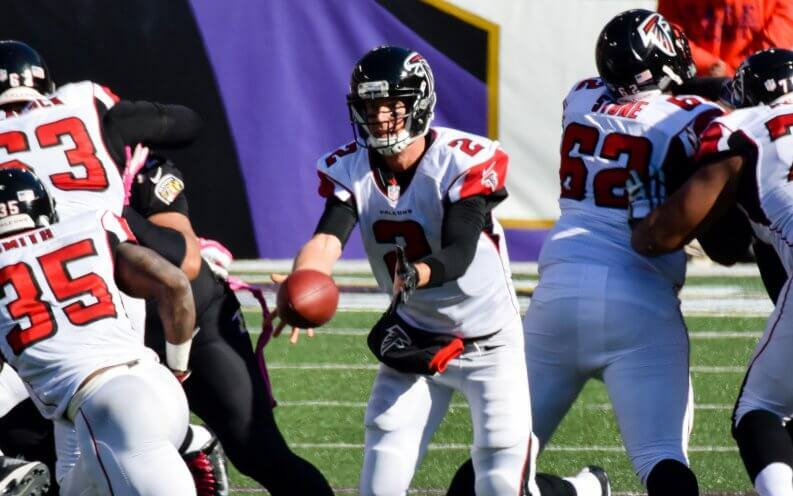 Matt Ryan signed a five-year, $103.75 million contract that keeps him on the Falcons through 2018. With a cap hit of $23.75 million, his base salary is $15.75 million. 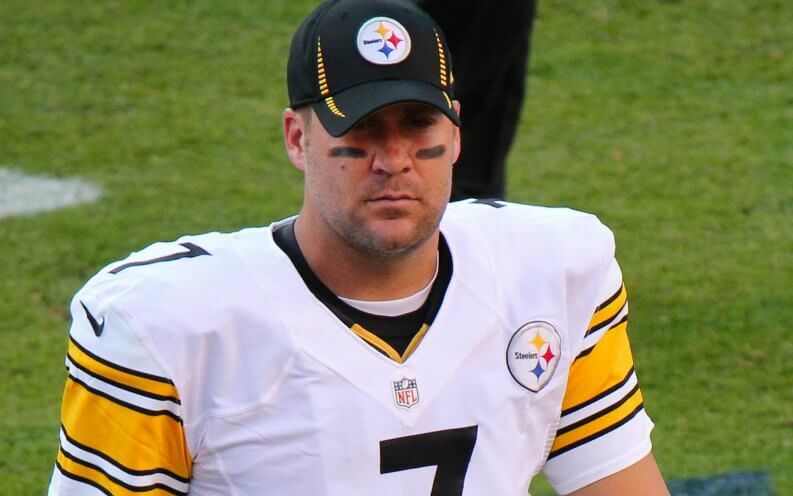 Twelve-year NFL veteran Ben Roethlisberger has a net worth of $70 million and is currently in a contract that pays $87.4 million over four years. His base salary is $17.75 million with an overall $31 million signing bonus. Although many parts of his game often go overlooked, several analysts place Roethlisberger among the top quarterbacks in the game. 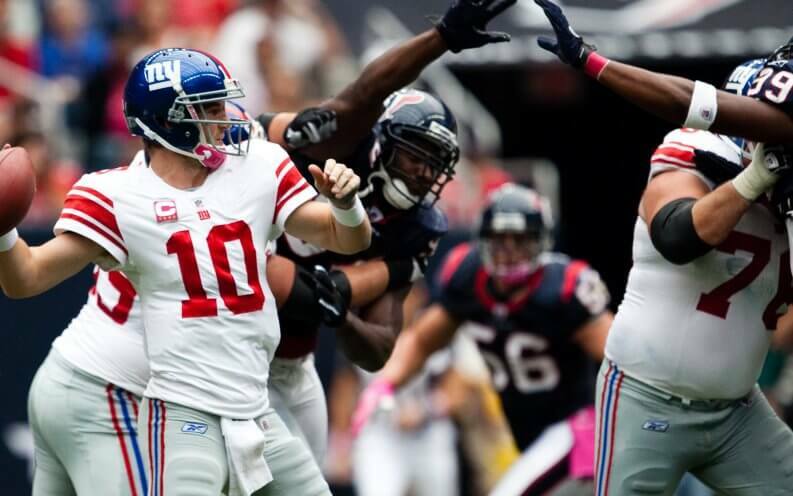 Eli Manning’s net worth is estimated at $100 million. The 12-year veteran was drafted first overall in 2004 and is currently bound by a four-year, $84 million contract with the New York Giants. That contract earns him a base salary of $17.5 million. 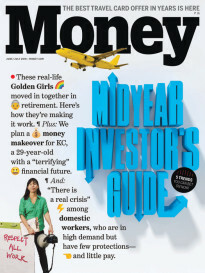 This article originally appears on GoBankingRates.